God’s extravagant love binds us together as a family. Long before we were aware of this, God knew us. He chose us, even with all our flaws and shortcomings, to be His children. Having justified us, he gave us his glory! What extravagant love is this! Forgiveness is not an easy thing. Not only do I know this from personal experience, I just recently saw it played out in my daughter’s 3rd grade class. One girl wronged another and a fury of not so nice notes passed between them and then shared with the multitudes. The teacher does what he thinks is right by making the one girl apologize to the other, who is encouraged to accept the apology. Apology accepted or not, there is no forgiveness. In fact, a great divide happened between the girls in the class with even some of the boys taking sides. What went wrong? Why wasn’t there forgiveness? I think we learn a lot about forgiveness from this story and others, in which Jesus demonstrates forgiveness of sin. 1) Jesus has this amazing ability to look beyond the wrongful action and look at the person’s heart. What does it mean to look at someone’s heart? 2) Jesus allows the person to express their feelings. In this case, he allowed the woman to shower him with gratitude. What could have happened if the teacher allowed the space and time for the two children to express how they were feeling? 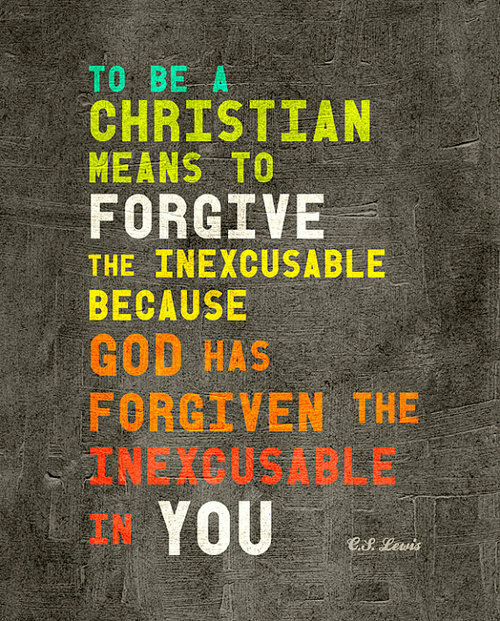 How do you role model forgiveness? 4) The radical love this woman receives from Jesus leads her to extravagantly give herself back to him. What does our example of love and forgiveness demonstrate? Does our love and forgiveness show the world we are followers of Christ? The woman is this story showed her gratitude by cleaning Jesus’ feet. Collect toiletry items for the homeless shelter in your town. Extravagant God, thank you for lavishly pouring your grace over our dirty bodies. Continue to fill our community, our homes, and our daily lives with Your sweet fragrant love. May the aroma remind us to forgive others as you have repeatedly forgiven us. Amen. Tags: devotion, family, forgiveness, Jesus, Luke 7:36-8:3, prayer. Bookmark the permalink.